I have a patient that has a Right shoulder surgery infection that will need 6 weeks of IV abx. He has a pacemaker on the Left side which is the only side accessible for a PICC, I do not see any contraindications per the Infusion Therapy Standards of Practice. Just checking on what the practice is for this type of patient. Not ideal but it can be done when you have to. Be sure to check on the type of pacemaker. Now we are seeing leadless pacemakers, making life easier for us and the patient. 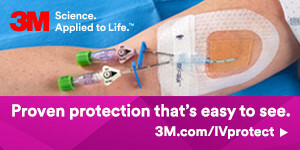 My company has an updated online CE course on Implantable Cardiac Devices and CVADs. Visit our website to learn more info. I agree, Lynn. Not ideal. Often, you cannot even thread the PICC beyond the Pacemaker/ICD. Sometimes, as stated above, there isn't any other choice. There was a wonderful Poster at the AVA Conference in DC about this. I took some pictures to use to justify or conservative approach. We had just seen a patient with a PICC on the Pacer side for the convenience of the Nurse. I took your course last year online and it was very helpful. I remain concerned about the removal of the PICC and dislodgement of a lead wire, so we avoid that side if we can.